Links, patties or chubs. Fresh packed or lightly smoked! 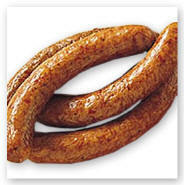 This versatile sausage with a flavor unique to Northwest America and Canada is great with beef, pork, most wild game or a combination of all. Nitrite cure is packaged separately. If this mix is used to make fresh sausage, simply discard cure. For 10 pounds of meat!